The Earth is one globe, – and all its water circulates around the globe. Water flows from springs, or it trickles as ice-melt from mountain-tops, in small streams that meet other streams down hill and join these and eventually they form rivers, small or large, that flow over long distances until they open into the ocean. In turn the surface water of the oceans evaporates and forms fog or clouds. The clouds float on the winds around the globe, until they give up their vapour in the form of rain or snowfall, some of it feeding icecaps and glaciers. Since 1998 many of my works are dedicated to water. In many of these I bring the focus onto waterfalls, as they are a mighty expression of the water element. I also choose to work with the water in my immediate surroundings, that is, in the country where I live, Iceland, a country that is surrounded by the ocean. Which ocean, some might ask, but how do we divide the global ocean into several adjoining bodies of water called oceans? Where does one ocean end and another begin, – what could be the boundaries of such vast water bodies? And that leads to the question; why is man so obsessed with creating boundaries? Why should we create boundaries that crisscross the entire surface of the globe? Names of places like; Provence, Giza, Machu Picchu, Burundi, Ghana, Timor, Germany or Canada, were these names given to separate people? Or were they given to illustrate geographical location of places? Water cannot be “national” in essence: It is global. 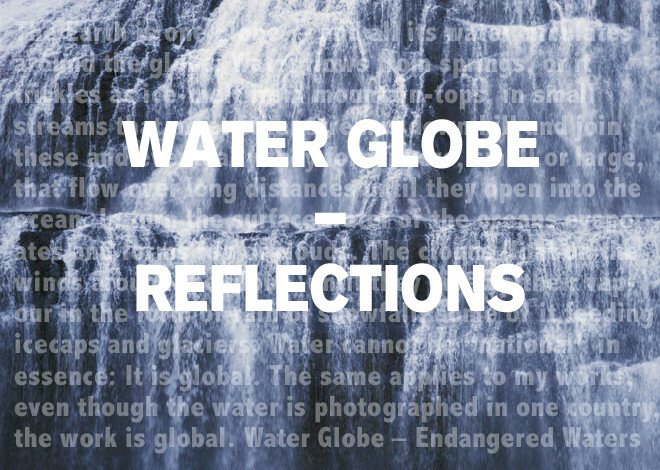 The same applies to my works, even though the water is photographed in one country, the essence of the works is global. The works often bear titles referring to danger, or endangered waters. Some are large-scale video installations with audio, and some are interactive. Others are photographic installations, or video-performances with audio. Vocal VI is the most recent of these. Vocal refers to the voice of the waterfall – a mighty waterfall has a mighty awe-inspiring voice. But if the water flow dwindles or the water disappears that voice will die.